Includes wax warmer, 14oz Brazilian hard wax, 2oz pre-wax oil, 2oz post wax gel, 20 applicators and an instructional DVD. Specially good for coarse hair. All for around $45. Kit comprises 500ml wax warmer, 3 packs of hard wax beans and 10 wooden applicators. Adjustable heater, great for ladies or men. Available currently for around $35. An easy to operate, quick melting, heat adjustable wax heater, with automatic shut-off feature, 4 packs of hard wax beans and 10 applicators. Available for around $35. Bright and attractive electric wax warmer with 14oz pot, 4 packs of wax beans and 10 wooden applicator sticks. Heat adjustable, automatic cut-off. Available for around $35. Good value for money kit at around just $27. Includes adjustable wax heater, 4 packs of wax beans and 20 applicators. Transparent lid for easy viewing of melted wax. There are two types of hot wax used for hair removal; soft and hard. Which you use may well depend on the area being treated - hard wax tends to be better for sensitive areas such as bikini line, underarm or face, whilst soft wax is quicker and more efficient for larger areas such as legs, back and chest. The thermostatically controlled electric wax heater is designed to take cans of hard or soft wax up to a maximum of 14oz. It has 3 heat settings - low, medium or high. It has a transparent lid so that you can see how the wax is doing. The downside of this warmer is that it does not come with a removable container for cleaning, as some other do. Designed for Brazilian bikini waxing, but also ideal for any sensitive, delicate areas. This hard wax comes in a 14oz can, ready to open and put into the warmer and contains soy bean and olive oil extract. This light, pre-epilation oil is important for protecting and conditioning the skin whilst providing for more effective epilation. It should be sparingly applied to the treatment area immediately prior to applying the wax. Ingredients: Soybean Oil, Ethylhexyl Isononanoate, Tocopheryl Acetate, Grape Seed Oil, Squalane, BHT, Green 6 (CI61565). The gel is used after waxing to cool and soothe irritation. It includes cucumber extracts to reduce redness, plus aloe vera, glycerine and menthol. The kit comes with 10 each small and large spatulas for applying the wax to the skin. Finally, the whole kit is completed with a written set of instructions as well as a DVD. We strongly recommend that you read and watch both carefully before use, specifically observing all precautions. This kit is pretty comprehensive with just about everything you will need, and is currently available for around $45 online. We would, however, recommend the separate purchase of Gigi Clean Collars, designed to avoid wax spills onto your warmer to make it easier to keep clean. The wax heater has an adjustable temperature control from 160 - 240°F and automatically cuts off when the selected temperature has been reached. It has a removable, 14oz capacity aluminium wax pot which makes it easier to clean after use. There are three, 3.5oz (100g) packs of different flavored hard wax beans included with the kit; chamomile, lavendar and black. The whole kit is completed with 10 wooden applicators. This is a good little home waxing kit for the $35 price tag, and I like the facts that the can is removable and the heater has a good temperature control. We would recommend you purchase and use a pre-epilation oil when using hard wax, actually a simple coconut oil will do the job. This fully heat adjustable (160 - 240°F) wax heater has a see through lid and 14oz capacity, easily removable pot. The auto shut-off function means that the heater will stop once the correct temperature is reached and re-start once it falls below 160°F. The removable pot makes it easier to clean up after use and the see through lid allows for visual monitoring of the melting process. There are four 3.5oz packs of different flavored hard wax beans included in this kit: chamomile, chocolate, lavender and original. The set is completed with 10 wooden application spatulas. Another good little home waxing kit, available online for around $36. 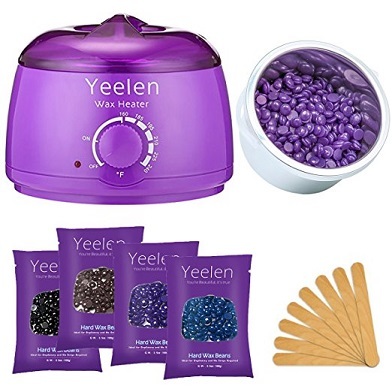 An attractive, purple wax heater with heat selector from 160 - 240°F, with transparent purple plastic lid so that you can see the wax melting. The heater is thermostatically controlled and automatically shuts off when the selected temperature is reached. The 14oz capacity wax container is removable for easy cleaning and can accommodate most wax types including hard, soft, loose and cans. Four 3.5oz packs of hard wax beans are included: chamomile, chocolate, lavender and original. The set is complete with 10 wooden applicator sticks. Available for around $36 online, this is much the same as the Wokaar kit above, with the colour being the main difference that we can see. This heat adjustable wax heater (up to maximum 80°c as stated on the box) has a removable pot with plastic handle and see-through lid. The temperature knob has settings of off, on, medium and high and there is an automatic cut-off when the correct temperature is reached. There are three 3.5oz packs of hard wax beans included with the heater: rose, lavender and aloevera, plus 10 wooden wax application sticks. This is the least expensive wax heating kit that we have included at less than $30, representing value for money if you are on a budget.